Now that we are back from our trips, we have started to settle back into our lives here in beautiful Southern California. Since our eventual goal is to find land and build a home and farm, we have started practicing/learning some of the skills we will need in our future. Meet Betty and Ginger, our new additions to the family. We brought them home a few months ago and this is a picture from their first day home. 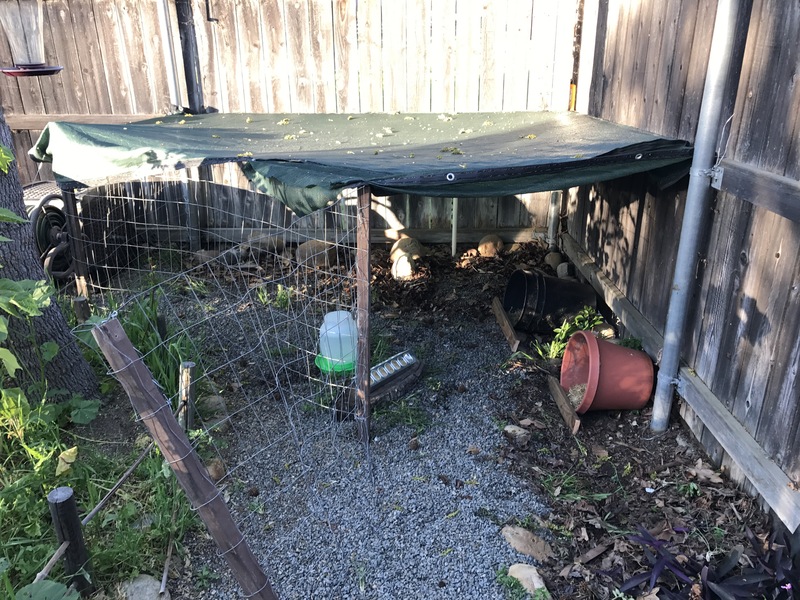 With the help of a friend, we made them a basic outdoor coop using recycled materials. It’s nothing fancy but it does the trick. 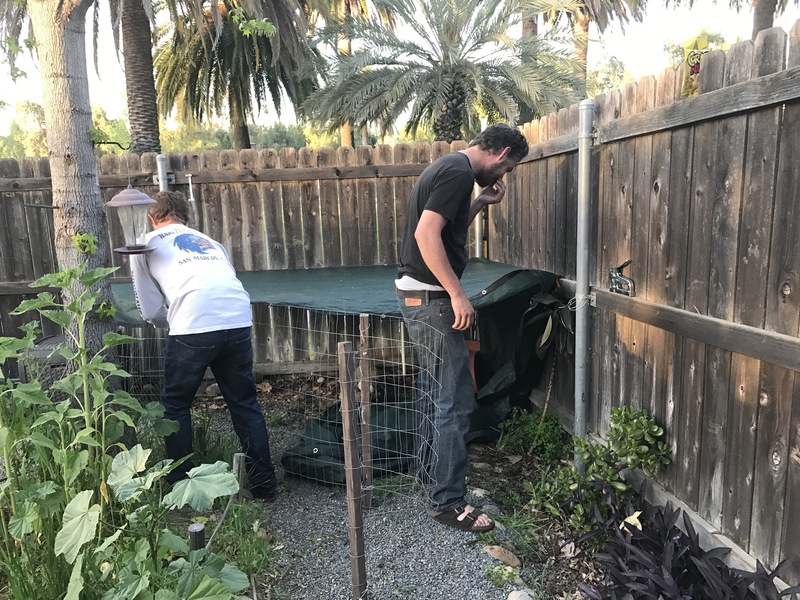 We do not have many predators in the area and since Southern California barely gets any weather variations, it offers them enough protection from the elements. It was an inexpensive venture — we only paid for their feeder and waterer, feed, and the two of them. They have been doing well so far with only a couple of run-ins with the dogs. They are not yet laying eggs but have grown quickly and should soon start producing. It has been fun to have them in the yard. 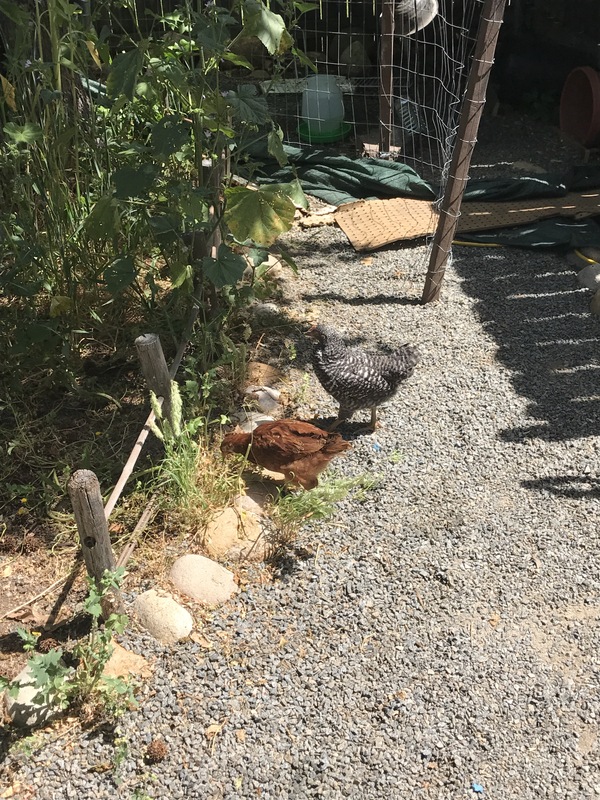 We like that we can give them food scraps and that they take care of bugs and weeds in the yard. 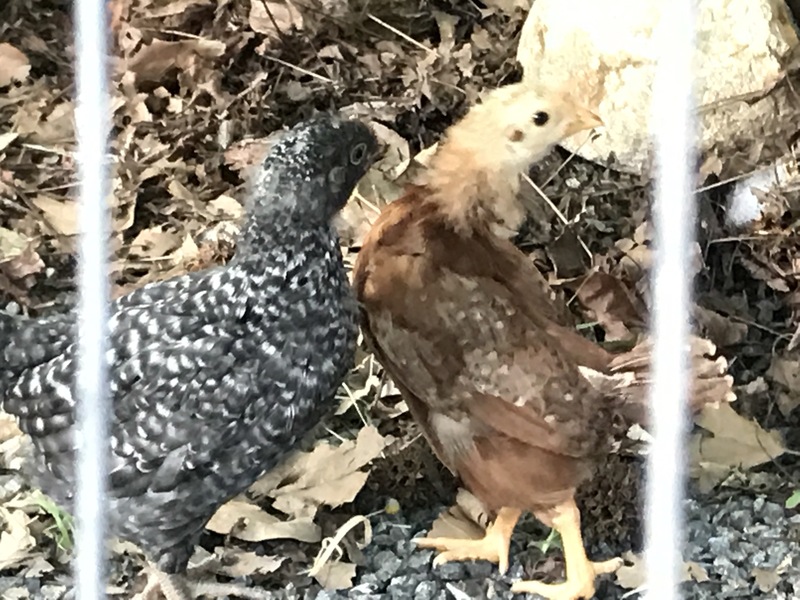 Betty (left) is a Plymouth barred rock with a sassy attitude. She thinks my toenail polish is food and tries to nip at my toes when I am in the yard (and she’s pushy about it, too). Ginger is a Rhode Island red. She occasionally goes for my toes as well but she is not as aggressive about it. Nor is she as nervous around us. She will let us pick her up and hold her, and perch on our arms. Aside from the chickens (who we have already found homes for when we do decide to leave), we have started growing different vegetables. We first started with a tire garden filled with potatoes. Then it expanded to include peppers, zucchini, tomatoes and more. We also made some repairs inside the motorhome to our broken living room blinds. We have herbs and a succulent planter inside and the lack of light was not helping them thrive (nor was I too happy with it). Instead of paying a stupid amount of money for new blinds or to have someone fix them, Andy and I decided to enlist the help of YouTube. We are a pretty fantastic team and quickly found that we could fix the blinds ourselves, even though they were the tricky “day/night” kind. Now that they are both fixed, we can replant some of our indoor plants! The cats are happy with the change, as well. We have decided to build them a temporary “cattery.” It will sit alongside the driver’s side of the RV with access through the window. Right now, we are still in the early building stages but eventually there will be shelves/branches for them to climb on. Since they are untrustworthy outside and I don’t always have time to follow them around the yard, this will give them safe access to the outdoors and will hopefully keep them from getting too bored. As I told Andy, it’s not their fault that we moved from 1500 sq. ft. to 300 sq. ft.
Aside from these projects, we have just been living our lives! I ran my 5k last weekend and am proud to say I ran for most of it. I know it’s not a very long distance but as someone who doesn’t run, it was an accomplishment for me all the same. We checked out the new brewery in town (delicious). We took the dogs on a hike and did part of Iron Mountain. Hopefully, we will have a new batch of soap made soon. I am attempting a new process/recipe so wish me luck! It looks like we will be stationary here for a while longer (I know, it’s a hard life) so while we are here, we are trying to learn more and more about being as self-sustaining as possible. Stay tuned for more!